The Taurus Indoor Bike IC90 Pro meets the requirements of professional gyms as well as ambitous home trainer: first class stability and loadability for even the most intensive use and a high training comfort thanks to the adjustability to the user. Material and finish are of first class quality: The steel frame is precisely welded and very loadable due to its special shape. 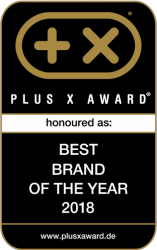 Besides the robust frame design, metal pedals and a high-quality ball bearing ensure a long durability. Thus, the Taurus Indoor Bike IC90 Pro is ideal for gym use with a frequent, intensive training. The 21 kg cast-iron flywheel results in a joint-friendly training with a smooth concentric run. Due to the transmission from a big jogwheel to a small jogwheel, the balance mass is then extremely accelerated and runs much smoother. The handlebar and saddle of the Taurus Indoor Bike IC90 Pro also provide a comfortable workout, because both can be precisely adjusted on the specialised rails and are thus also suitable for taller users. A scale helps you to find your settings again, in case several users exercise with the Taurus Indoor Bike IC90 Pro. Doing a relaxed training in upright sitting position or an intensive race training: The Taurus Indoor Bike IC90 Pro is equipped with a professional multi-position handlebar with grip possibilities for numerous training varieties. The Taurus Indoor Bike IC90 Pro is the sole model of the series, whose handlebar is equipped with extra arms for special race training. The Taurus Indoor Bike IC90 Pro is equipped with a cover above the flywheel to protect from sweat falling down. A bottle holder and transport wheels are also included with the stylistic Taurus Indoor Bike IC90 Pro. 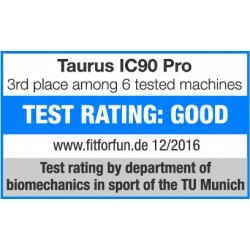 Our conclusion: The top quality and the first-class equipment make the Taurus Indoor Bike IC90 Pro a fitness machine, in which leisure sportsmen and pros will enjoy using alike! Nachdem ich bei Tiedje in Berlin „probegefahren“ bin, wusste ich, dass es dieses Bike sein soll. Super kurze Lieferzeit und auch der Aufbau war ohne Anleitung hinzubekommen. 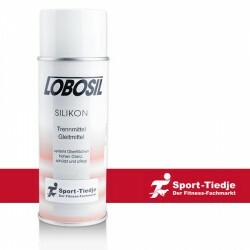 Ich bin kann das Gerät absolut weiterempfehlen. Taurus training computer for indoor cycle In stock! Taurus Indoor Bike IC90 Pro add to comparison list.